I have done extensive research and have found several recommendations for the maximum length of a M4A audiobook to avoid playback problems. The problem usually results in playback stability issues such as the bookmark position being lost or the iPod skipping to the next item in your playlist while you are in the middle of a long audiobook. The problem is very prevalent on the Video iPod (of course this is what I have) and less so on the newer iPods. The recommendations I have found on this forum and other places are in the form of a maximum length in hours (usually less than 5 hours) and/or in the size of the file. I have found that neither length in hours or the file size appear to the main driver for the stability issues. I have found that if the number of audio samples exceeds approximately 700 million samples, then the stability problems occur. See the chart below of information I compiled some time ago. This means that if you limit the audiobook to 700,000,000 samples, then the length of the audiobook will be below the max length in hours listed in the table below. I normally encode my audiobooks as mono with a bitrate of 16kbs and at a sample rate of 12.0 kHz. Using these import settings in iTunes I can create audiobooks that are slightly over 16 hours long without playback issues. Hopefully this will be of use to those of you looking to maximize the size of your audiobook without needing to split it into multiple parts. I have found that if the number of audio samples exceeds approximately 650 million samples, then the stability problems occur. This translates into the following maximum lengths. how do you change the sample rate when converting in itunes? also, are you now using a classic? can you verify whether or not these problems persist there? Change "Import Using" dropdown to "AAC Encoder"
Click on "Setting" dropdown and choose "Custom..."
On the AAC Encoder settings dialog you will see a bunch of settings including a setting for the sample rate. I can't confirm whether the problem is fixed or not, since I have a 30GB video iPod. Does this mean that almost all audiobooks fall into this category. Most are pretty long. I am a real novice at this. IS THERE A QUICK NON-TECHY FIX? There is no "FIX" for this. 1. Import each audiobook CD as a single file (select all the tracks, click on Advanced->Join CD tracks) at spoken podcast quality. 2. Modify each audiobook file to have Remember Playback Position and Skip On Shuffle. When you want to listen find the Audiobook playlist and play. It will remember which disk you were on and where in that disc you were. When you want to "reset" the book, go to the CD - Audiobook playlist, select all the tracks, right click one of them and choose Reset Playcount and answer Yes. Don't bother trying to combine audiobooks into one file. If you do, then use the chart you quoted to determine the maximum length you can go based on the quality you use to import. cjmnews is right that there is no fix for this. Apple would have to update the firmware for their older iPods to fix this ... that assumes they can fix it. No one knows the exact cause except Apple. It may not be clear from the chart I posted above, but Audible, Apple's audiobook partner, limits the length of their audiobooks to within the limit I listed above (see green markers on chart). My quick non- techy solution is to reduce your sample rate and/or split your audiobook into mulitple parts. Apple now provides a range of sample rates in iTunes 9+ that you can select directly under the AAC Encoder custom settings. If you're using iTunes 7... then upgrade. With these settings, the average unabridged audio can be a single file (i.e. less than 15 hours). For longer audiobooks you can split them into 2 parts. Very few audiobooks are longer than 30 hours. I would still rather have an audiobook in 2 parts with chapters than have 10 to 20 files (if tracks joined so one file per disc) or 120 to 250 individual tracks. Selecting the "Auto" setting for sample rate with the other settings above, iTunes uses a sample rate of 12 kHz. If you vary the bitrate and leave the sample rate setting on Auto", iTunes will vary the sample rate with the bitrate. You won't have direct control, but you can get more than the 44.1 and 48 kHz settings. You'll have to use trial and error to see what iTunes selects for a sample rate given the bitrate. If you want more control over your sample rate then that and don't want to upgrade, then you will need to use another program that uses the Nero encoder or FAAC. What would be upgrade recommendation to fix? I was very glad to find this post. I have been fighting this 'lost bookmark' problem for a while and it is driving me nuts. I can't stand dealing with multiple tracks, but it seems like that's what I'm left with on the very large books. However, I'm seeing the problem show up on large tracks that are still relatively small and even fit within the specs you've listed. However...I AM using an old 5Gen video ipod. So I'm guessing that doesn't help the situation. You mention that the newer iPod models handle this problem a little better (though not perfectly). If that is indeed true then it is worth upgrading. 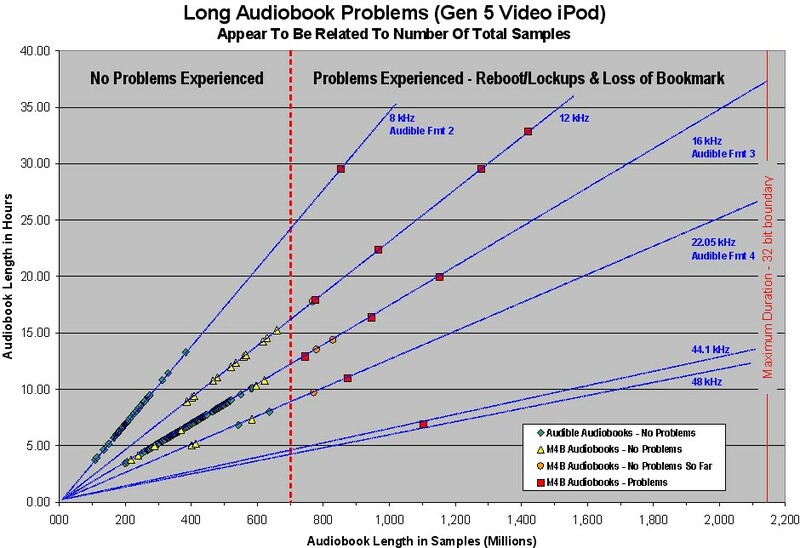 So here's my question...if I were to upgrade for the sole purpose of making this 'large audiobook' problem better, is there a particular model anyone would recommend? I need at least 80GB and that's about all that really matters to me (besides improving the audiobook problem). I have not heard of a model of iPod that can handle it any better than the one you have. They are all limited. Upgrading for the large audiobooks is not a good reason to upgrade. Upgrading for capacity, or camera or tilt screen would be a better reason to upgrade. @Jloded I can't tell you how awesome it is to stumble across this post, I LOVE chapter and verse, it has changed my life lol. I know this is a long shot, and more than likely you won't see this, since this thread is almost 10 years old now, but I can't send you a pm, so here goes; I would love to see chapter and verse updated again so I can use it with my current itunes and windows 10. If nothing else, would you shoot me an email and let me know you at least got this message?